A dental emergency can happen anytime and anyplace. You might not be near a dentist when it does. Some people panic and make mistakes. In times like these, that may cost you in the long run. Try to keep a level head. Here are some ideas until you can be seen by your dentist. The most common dental emergency is losing a tooth. Should your tooth become dislodged, you should keep it. You never know if it can be replaced. And it is better for you to have it and not be able to use it than to be able to use it and not have it. Place it in a bag of ice, if possible. Definitely, keep it clean and isolated. You’ll want to cover the empty area with gauze until you can see your dentist. If you take pain killers, don’t let them near the area. They can burn your gums. When a tooth breaks, it is best for you to keep the piece. If you can’t find it, don’t worry. The dentist should be able to figure something out. Rinse your mouth out, in case there are pieces of your tooth lying around. You’ll want to use a cold compress if there is swelling. Make sure that you get to a dentist as soon as possible. In many cases, the tooth can be wired or glued back together. You just have to suffer through the pain, until you can be seen. Use a cold compress to keep down the swelling. Call your dentist immediately to see them and take Tylenol or Advil until you can see them. Try not to play with the tooth or move it around, you don’t want to make matters worse. If you need to, put gauze or cotton balls around the tooth. This may prevent it from moving or rubbing against anything in your mouth. If you need to pad it on both sides with cotton balls or gauze, do so. The pain may increase if the tooth is moved or it may become completely removed. The less damage done, the easier it will be for your dentist to save your tooth and with as little pain as possible. If you pop or break a wire, it can be very painful. Use the eraser end of a pencil to push it away from your cheek or tongue, to a position that won’t hurt. If it still pokes you, cover it with wax, gauze or a cotton ball. But, whatever you do; don’t cut it! You may accidentally swallow or inhale it. And then you’ll have bigger problems. Make sure that you contact your dentist and explain what’s happened. Most can fit you in and have emergency numbers for after-hours issues if it becomes that severe. If you have an abscess, you need to contact your dentist and let them know. It can be the sign of infection and may cause your gums to deteriorate. Once your gums lose tissue, it cannot regenerate. Rinse with a mild saltwater solution several times a day until you can be seen. In the event there is an actual injury to your soft tissues, you’ll want to cover it with gauze, after the rinse. You’ll need to hold it in place for around twenty minutes to control the bleeding. You can use a cold compress for swelling outside your cheek, which may also help with the pain. Should the bleeding continue, you’ll need to go to the emergency room or see your dentist. They should have an emergency line, for contact in just such a situation. They may tell you to just go to the emergency room, depending on what your wound is like. In a dental emergency, some people aren’t sure if they need to see a dentist. If you lose or break a tooth or damage soft tissues in your mouth; you definitely do. These are all things that can be fixed if seen soon enough. 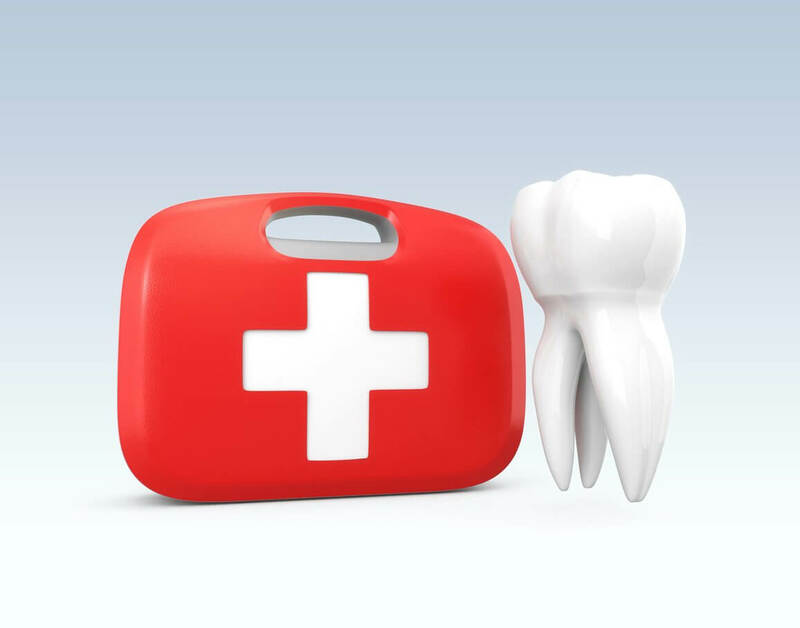 However; a dental emergency can go wrong and you may lose your tooth, soft tissues in your mouth or end up needing attention for something like an infection or a surgery. These are all things you will need to see a professional to determine. If you don’t have one, aren’t able to get ahold of yours or need a new one; start here. McCauley Dental will do our best to fit you into our schedule immediately if you are experiencing a dental emergency. The important thing is to try to stay calm. Panicking can make things worse. You will make more mistakes and could possibly bleed more. The last thing you need is to make the problem worse or create another one. Focus on controlling the pain and the bleeding until you can be seen.